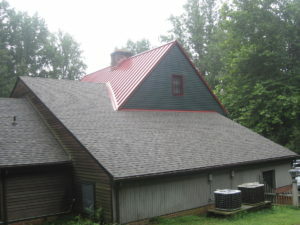 Metal roofing is becoming an increasingly popular roofing style choice among homeowners in the Baltimore area. This is thanks in part to its incredible durability and resistance to fire damage and insect infestation. However, what some homeowners might not know is that today, metal roofing has become more stylish than ever and can add a level of curb appeal that even asphalt shingles can’t match up to. Plus, there are many styles and colors to choose from, giving you the distinct ability to find something that perfectly matches your preferred aesthetic style. Roland Slate Service Company offers and installs metal roofing on homes in your area, and with over 25 years of industry experience under our belts, you can feel confident that we will get the job done right. You can be sure that your roof will also look sleek and stylish, and it will require very little maintenance to maintain its stunning visual appeal. When you choose Roland Slate Service to install metal roofing on your home, you will be treated like the valued customer you are. We will take the time to help you design the roof of your dreams and install it with care and precision. Plus, we offer the peace of mind that comes with a lifetime material warranty on all our metal roofing products. For more information on our metal roofing services, contact Roland Slate Service and set up a free consultation at your Baltimore area home.